Florida’s Red Tide Bloom from the Gulf of Mexico to Fort Lauderdale – Coercion Code – "Dark Times are upon us"
HABs, also referred to as “red tides,” occur when colonies of algae grow out of control and produce toxins that threaten the quality of fresh and marine waters, having adverse effects on both humans and animals. The cause of HABs is not well understood but it is believed nutrient availability, temperature and sunlight are some of the most likely environmental factors. The US has experienced significant algal blooms over the past five years. According to the US Environmental Protection Agency’s (EPA’s) National Lake Assessment, HABs were 8.3%-9.3% more common in 2012 than they were in 2007, with ever-increasing public health impacts. In 2014, an algal bloom in Lake Erie in Ohio left 500,000 people without drinking water for three days. In 2016, Utah Lake in Utah experienced an algal bloom that caused sickness in more than 100 people. More recently, in 2017, scientists were shocked to discover a major bloom on Skaneateles Lake in Syracuse, New York. The city’s main drinking water supply suffered the outbreak because the lake is hyper-oligotrophic, which means it has extremely low levels of the nutrients that algae blooms thrive on. This year, the most significant HAB was reported in Lake Okeechobee, Florida’s largest freshwater lake, an area that spans 730 square miles. On 12 June, a satellite image revealed that only 1% of the lake was covered in algae. However, by 2 July, 90% of the lake was covered, prompting the Governor to declare a state of emergency in seven Florida counties. Reports of skin irritation, consistent coughing, and nausea underscore the need to implement measures of surveillance and control to help reduce HAB-associated adverse health effects and prevent more debilitating and potentially fatal human illnesses. Red tide algae bloom has now reached Fort Lauderdale on the eastern coast of Florida, the algae bloom now stretches from Navarre beach west of Panama City in the Gulf of Mexico all the way down the west coast of Florida and around the southern tip of the panhandle to Fort Lauderdale on the eastern coast. 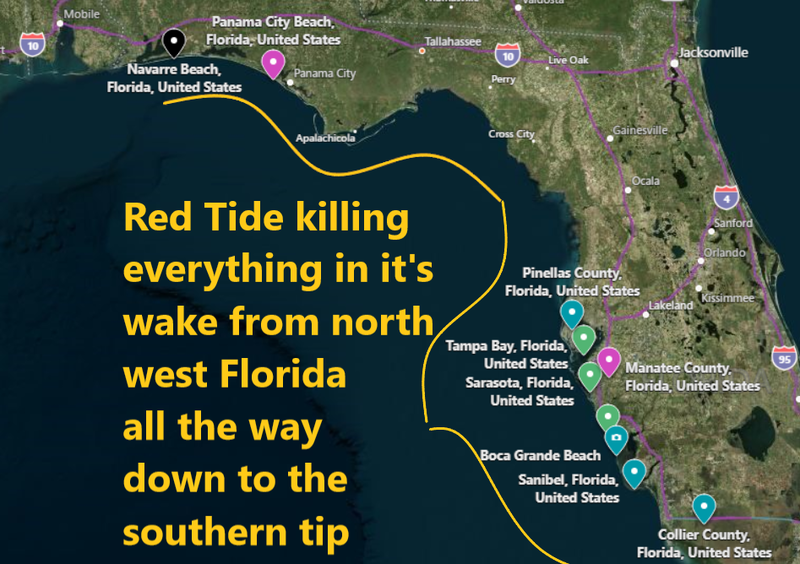 This summer has seen the death of millions, maybe billions of marine species from birds to fish, manatees, dolphins and turtles due to a red tide algae bloom with many experts saying they have never seen anything like it before. The latest report comes from ABC Local News claiming hundreds of dead fish have been found washed ashore Fort Lauderdale Beach, leaving officials to believe that toxic red tide algae has made its first appearance in Broward County. Mayor Dean Trantalis says beaches in the city will remain open until official test results from the Florida Fish and Wildlife Commission are confirmed. Those test results are expected to be returned by the end of Friday. Full story hereMeanwhile, Panama City Herald reports, crews might need until the end of Friday to unclog Mexico Beach Canal of fish likely killed by a toxic red tide algae bloom on Tuesday. Mexico Beach Mayor Al Cathey said the cleanup, which began on Wednesday, would be long and intensive because workers have had to remove the fish by hand with nets since machinery can’t fit in the canal. Meanwhile, the dead fish and the possible threat of more from another red tide has Cathey and some tourism advocates worried about a drop in visitors to the city and their wallets. “This is probably the biggest fish kill we’ve ever had in our canal,” Cathey said. “They were all crawling out because I guess they couldn’t breathe in the water,” Norris said. From the end of September. It started off slowly…And then exploded. 10th September – 33 TONS of dead fish wash up, due to red tide in Pinellas: Red tide is officially impacting Pinellas County. Crews have picked up a total of 33.48 tons of dead fish and hauled them off to the county dump. Tests conducted Monday show the highest levels of the toxic algae bloom near John’s Pass and Madeira Beach. Low levels were also found near the Bellair Boat Ramp and Sand Key near Clearwater Pass.